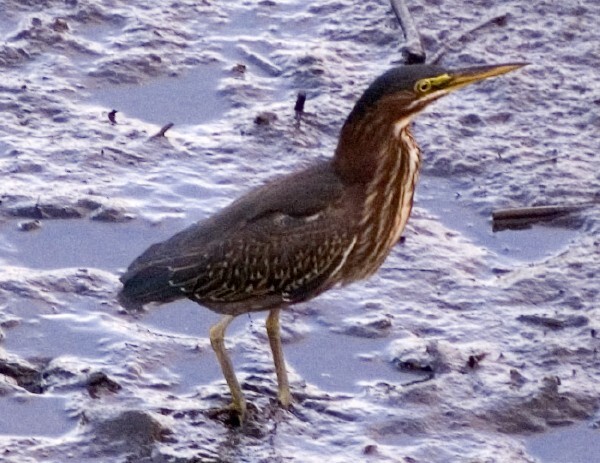 Eye Dull Musings: Green Heron? I'm not 100% certain, but I think this is a green heron. I saw it today at low tide while it was poking around in the mud outside my window. It's definitely not a great blue heron - that's for sure. If it is a green heron, I'm not really sure why it's called greeen. It looks brown to me. Dad says you're correct. It is probably an immature one, that's why there's no green yet. I maybe see some green in the eye area? At least in your photo.